You can easily transfer music from your PC to iPhone with iTunes, but you will find that iTunes is not that helpful if you want to transfer music from iPhone to computer. In fact, iTunes only allows you to transfer purchased songs back to its library, if you only have purchased music files in your iPhone, iTunes is a good choice. Besides iTunes, you can also use Dropbox and Leawo iTransfer to transfer iPhone music to computer. The following guidance will show you the 3 ways to let you know how to transfer music from iPhone to computer. People can use iTunes and iTunes Match to transfer music from iPhone to computer. The following post introduces 4 commonly-used methods to transfer iPhone music, including transferring purchases from iPhone to iTunes, using iTunes Match, Copying playlists from iPhone to iTunes and Moving iTunes library to external hard drive. These methods are helpful for either transferring iPhone music to computer, or backing up iPhone music. Check them out if you are interested. Run iTunes and click “Edit > Preferences > Device > Prevent iPhones, iPods and iPads from syncing automatically” at the upper left corner of iTunes window. Plug iPhone into computer via the USB cable, and then click “File > Device > Transfer Purchases” at the upper left corner. iTunes will start to sync all the purchased items back to its library. 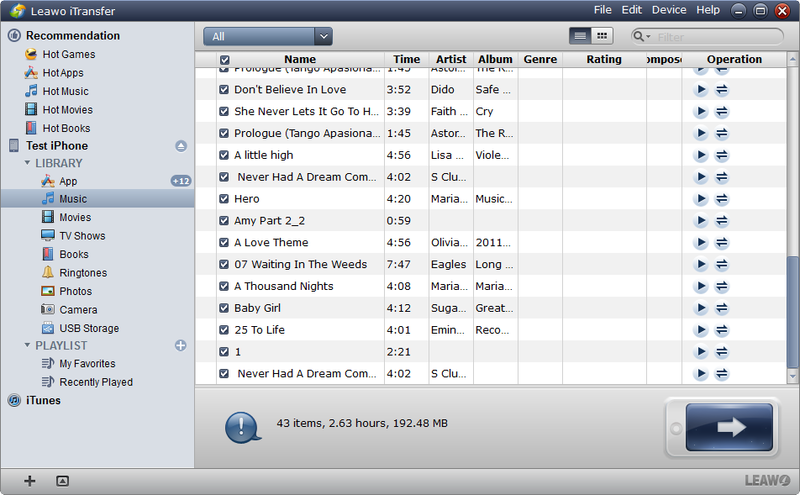 After the syncing process, you will get the music files in your iTunes library, including the purchased music files. 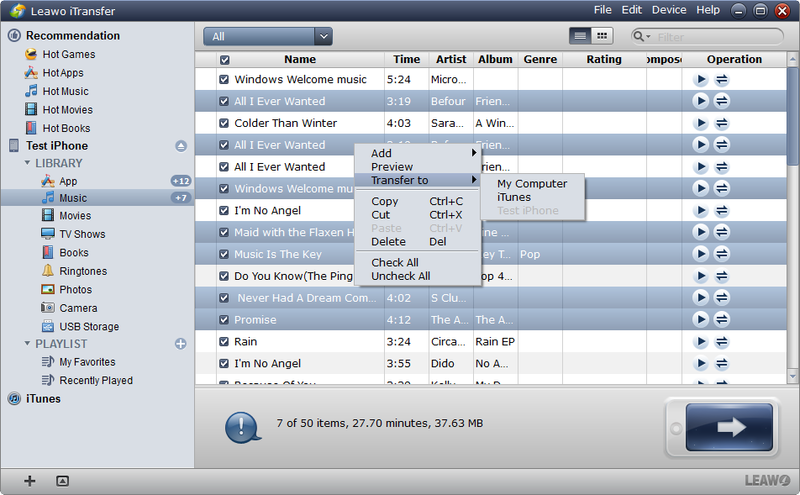 You are able to find the music files in the folder of your iTunes media files on your computer. The location of iTunes folder is listed as follows. iTunes Match requires users to have iTunes 10.5.1 or later, iOS 5.0 or later, and it also only supports iPhone 3GS or later, iPad 2 or later, iPod touch 3 or later. So we want to transfer music from iPhone to computer, we need to meet with the requirements. People should start their iTunes, and select “iTunes Store” at the top of the window, then you will see iTunes Match at the upper right side. Click “Subscribe for $24.99 per year” button, and enter your Apple ID to confirm the purchase. When it’s done, iTunes Match will star to scan your iTunes music library and upload the songs which aren’t saved in the cloud. Now iPhone users can tap Settings > iTunes & App Store on their iPhone, and tap iTunes Match to ON. 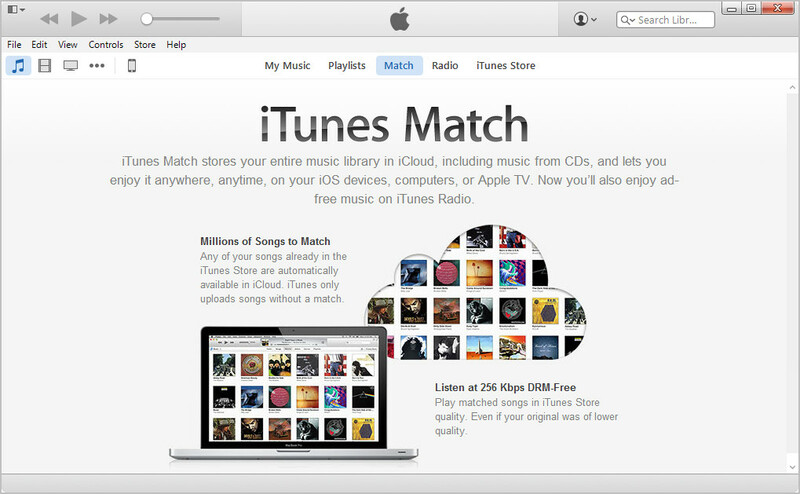 Now iTunes Match will upload all your songs to the cloud, and each song will have a cloud icon attached. Now you can download the songs from the cloud to your computer, and save the songs in iTunes library for offline listening. 1. Shut down auto sync by clicking Edit > Preferences > Devices and checking “Prevent iPods, iPhones and iPads from syncing automatically”. 2. Connect iPhone to computer with USB cable, and click the iPhone icon in the left sidebar after iTunes recognized your iPhone. 3. Find the playlist you want to transfer and right-click it, then choose “Export”. 4. The exported playlist will be saved as a XML file on your computer. Now you can import the playlist into iTunes library by clicking “File > Library > Import Playlist” at the upper left side of iTunes. After moving the playlists from iPhone to iTunes library, you will get your music library organized again. If you want to backup iPhone music before switching to a new computer, you can move iPhone music to external hard drive for a backup. Of course, you are able to copy the whole iTunes library to the external hard drive. As mentioned, you are able to find your iTunes folder on your computer, and now you only need to hit Ctrl + C to copy the iTunes library, and then Ctrl + V to paste the library to target folder in External hard drive. 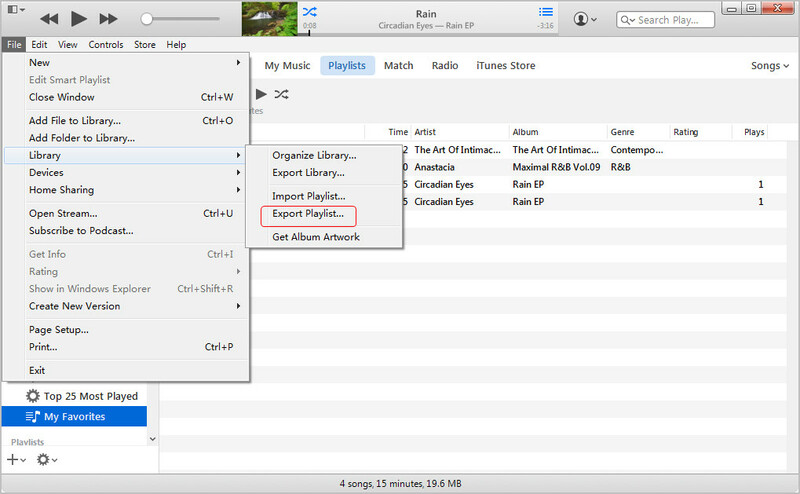 This method will be helpful when you want to restore your iTunes library on your new computer, and you only need to hold “Shift” key and open iTunes, then iTunes will ask you to choose a library. With this method, you are able to backup iPhone music easily and make them safe. iPhone users are able to transfer music from iPhone to computer with iTunes easily, but they aren’t allowed to copy non-purchased music files like CD copies using iTunes. If the users take a look at the third-party iPhone transfer software on the Internet, they will be surprised by the powerful functions of these programs. Leawo iTransfer is all-in-one iPad, iPod and iPhone transfer software. This software enables you to transfer apps, music, movies, TV shows, ringtones, ebooks, photos and Camera Roll without the sync of iTunes. Leawo iTransfer helps you transfer music from iPhone to computer within seconds, and it doesn’t distinguish the purchased music files and the non-purchased items. With Leawo iTransfer, the music transfer is easy to be done and doesn’t have any limits. The following guidance will show you how to transfer music from iPhone to computer, and you can free download Leawo iTransfer to have a try. Note that the trial version has limited transfer times. 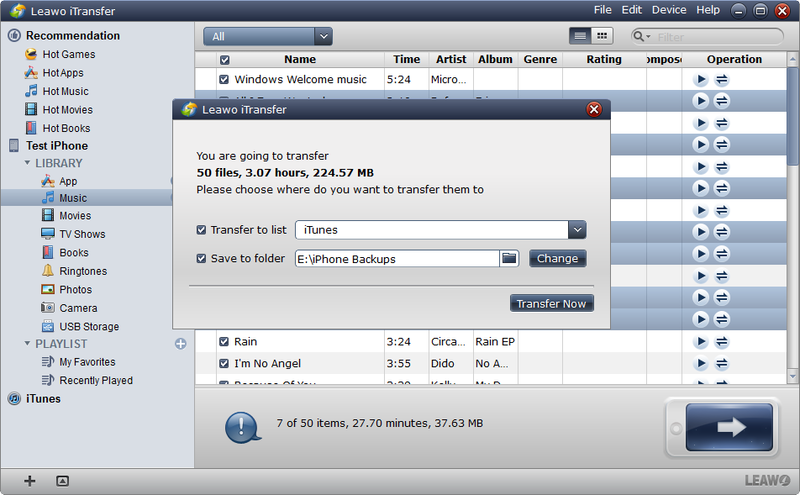 Tips: Leawo iPhone Transfer only works with iTunes installed on your PC. 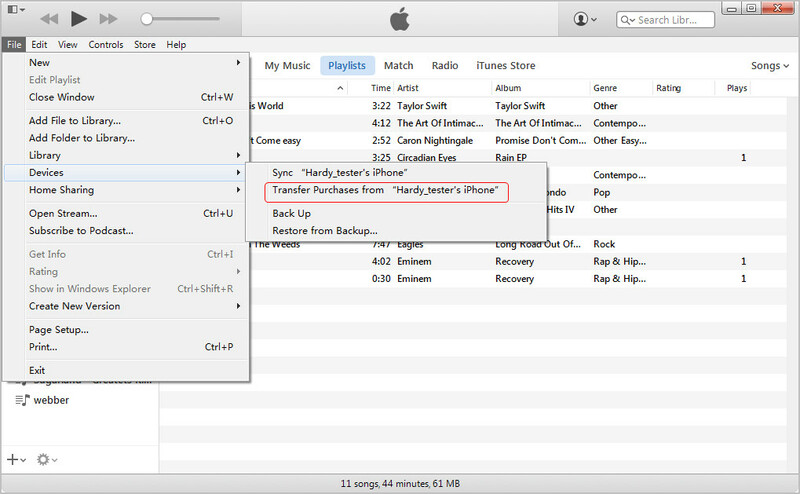 Besides iTunes and third-party iPhone transfer software, you are able to transfer music from iPhone to computer with other methods. On the Internet, you can find many solutions. The following guidance will show you three outstanding solutions. Among three solutions, Dropbox is now the most famous among iOS users and Android users because of its convenience. Users don’t have to spend much time waiting for the syncing process to be done. Once the files are put in the folder of the Dropbox, they will be shown in the Dropbox folder on your computer. According to Dropbox, the sync may take a while, but won’t take long. When the music files are synced to the Dropbox folder on your computer, you will be able to copy and paste them to any folder you want. Dropbox gives users 2GB for free use, and it only needs you to log in with the same account so that you are able to enjoy the service of Dropbox.